"I've been working on the railroad, all the live-long day!" The model features several neat printed pieces found in several Juniors sets and six mini figures, including four generic track workers, one track boss / conductor and the locomotive engineer. 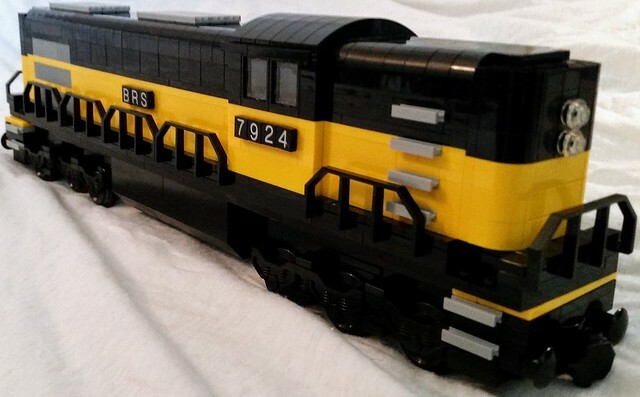 This model was originally a ALCO MRS-1 built by Anthony Sava, but has been so severely modified that it no longer looks like the prototype loco. So I went searching And found another ALCO locomotive, a RSD-12 that looks like my loco. Both my model and the prototype have the six wheels, and the same basic hood and cab design. The long hood of the loco has been designated the rear with a double red light. 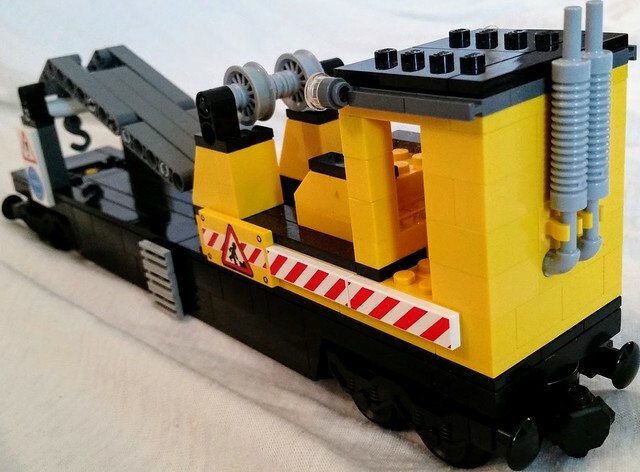 This stream crane model was heavily inspired by Whoward69's instructions for a set of crane and match truck train cars. I modified the original model seen here. I originally meant for the crane to have ropes to move the boom, but it got confusing on which rope went where so for now it's moved by the H.O.G. (Hand Of God) method. The crane can spin around in 360 degrees and lift anywhere up to 90 degrees straight up. (Their is a double set of pins keeping the boom from going too low, as well.) Here we see how the crane is hooked up to the depressed center flatcar most of the time. 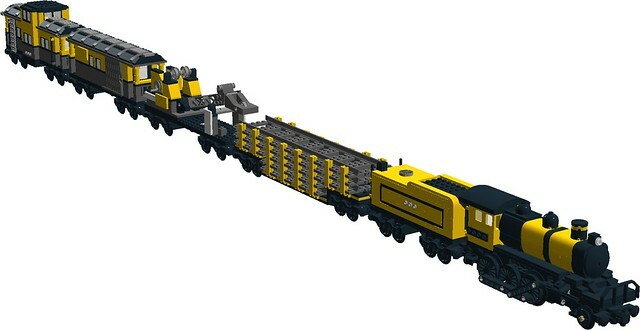 The heavy-duty depressed-center wagon has brick-built arms to secure the cargo of railroad track in place. 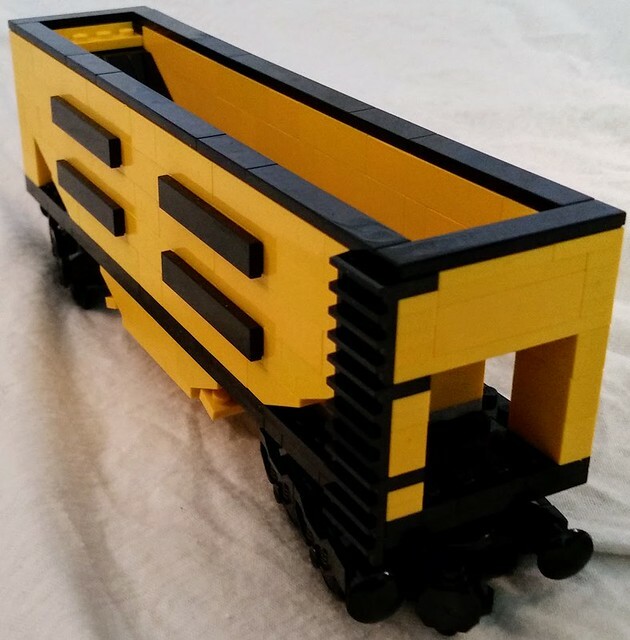 This model was inspired by a coal hopper on an older website called LGauge .com. I tunrned the old finger hinges into new pin-orientated ones and colored the car yellow to match the MOW paint scheme. 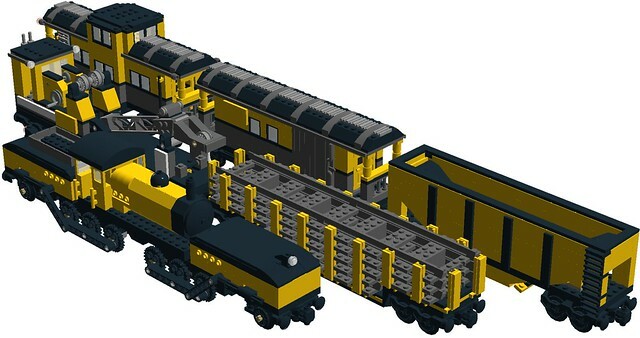 The hopper's bottom door open and can dump 1 x 1 round plates / bricks onto the tracks for ballast. The caboose features two ladders (one per side) and more of those fancy printed 2 x 4 tiles. The mini-figures seen above are stationed on the MOW train. As usual, Comments, Questions and Complaints are always welcome!! Nice! Love the train as well as the color scheme. 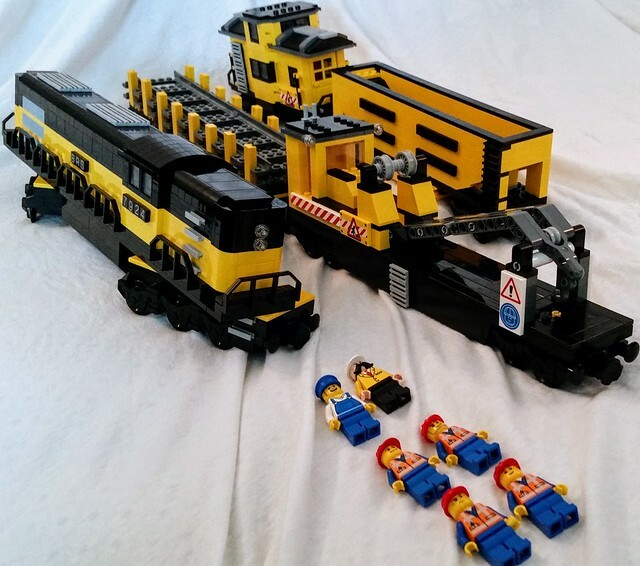 5 studs wide for the train body and 6 studs wide for the cabin works great. Thumbs up. Very nice! The train looks very complete with the matching colour scheme on the last two wagons. Regarding the overhanging crane, in many cases repairs are undertaken on two-track lines. This means that the crane (or more often two, working in tandem to increase lifting capacity and reduce chances of swinging loads) would be on one track, and could lift track panels off the wagons on the parallel track, then be shunted along to reach the place the panels are needed. Plasser-Theurer made some twin-jib cranes for exactly this purpose. Thanks on the color scheme, but the original inspiration for the 5-wide body was Tony Sava's MRS-1 model seen here. 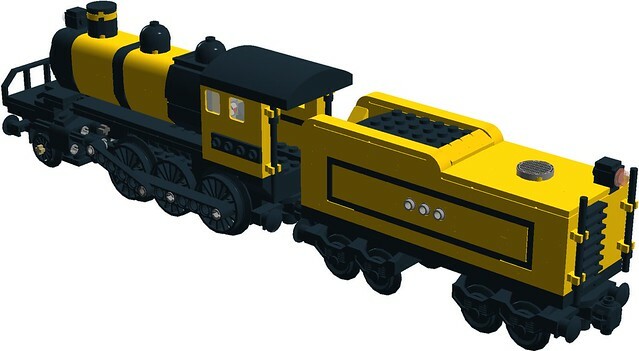 The LDD file, text and pictures were just updated with a new steam locomotive, revised train cars, and printed parts have also been added to the train in many spots. 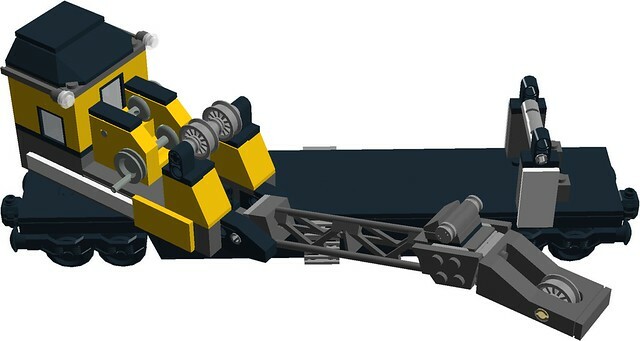 The rear of the crane car features the NEW control booth, and the first post has been updated as such with new pictures and crane-only LDD file! Main post updated with new Garratt-type locomotive and new ballast hopper car, and the entire first post has been retyped and restructured. thus having to order more, delaying the entire project for at least a week or two? Yep....that happened to me recently.......Nice train by the way! Thank you for the compliment! 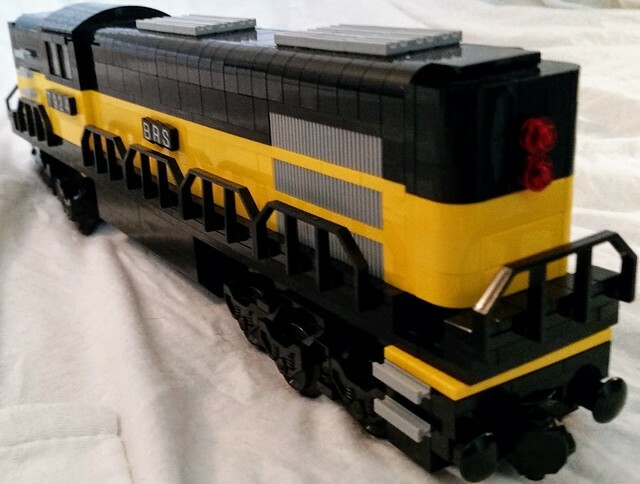 Since the last update on this steam loco, I realized I needed more weight over the drivers while building the model in real bricks. I have ordered a couple weight bricks and new boiler parts to hide them in in order for the wheels to grip the rails sufficiently for the pistons to work. I really want to see more of that steam engine you posted in an earlier post . This one @Goldenmasamune? The LDD file for it is available here along with an earlier version of the breakdown train. I sadly don't have any more photos of it besides the rear view. Yes, that's it! I really love the design! Would you be terribly offended if I built this? No, I would be excited! 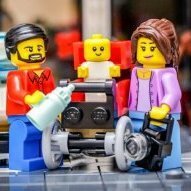 I always upload the LDD files so people can built things on their own, either by tinkering with my build to make it special or just making a carbon copy of what I did. Please post pictures when it's done @Goldenmasamune! The engine has been switched back to the RSD-12 diesel, and new real-life pictures are in the first post! 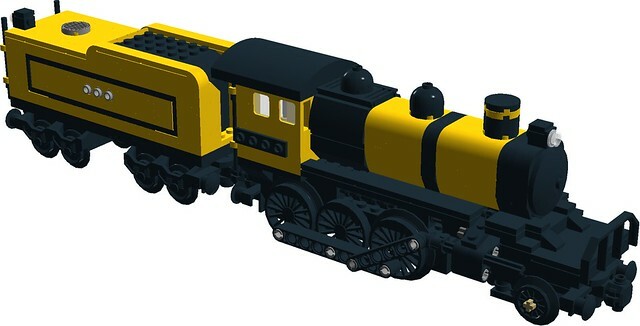 Do you have an LDD file for this design? Looks great! here you go: RSD-12 link. Enjoy! Thanks! 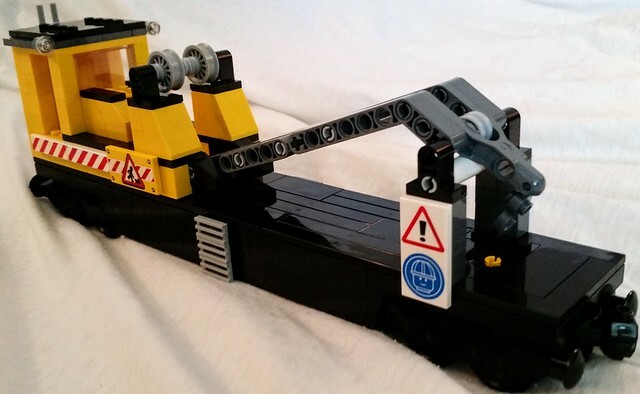 What about the crane and flatcars? Hopefully I will have all the parts for this in the next week or two. I have been wanting to build a steamer for quite some time. 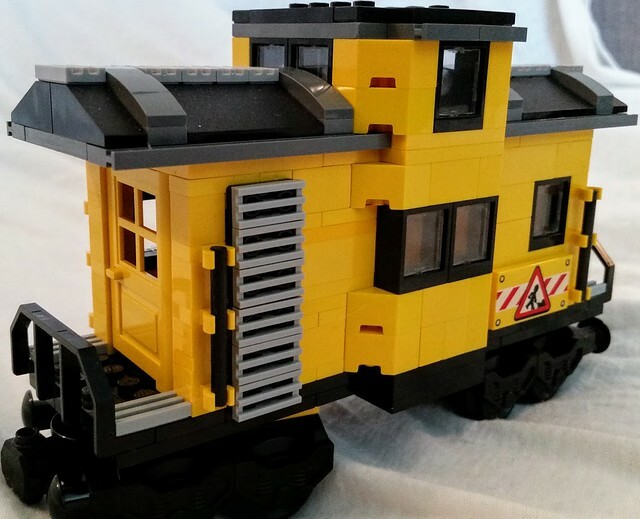 Do you have the LDD for the hopper car somewhere? Yes! See the above post with the whole train file, as the hopper car is in there with the rest of the train. Crap, sorry, I missed it. Thank you!